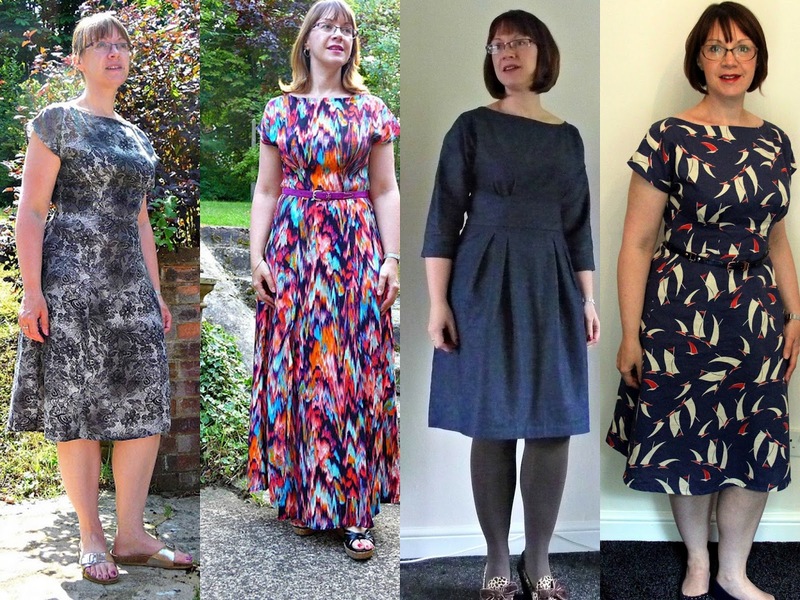 If you've been reading my blog for any length of time, you'll probably have guessed that one of my favourite patterns is the By Hand London Anna dress. To date I've made 4 versions of it: 1, 2, 3 and 4. Now I'm very excited to announce that I will be teaching a class on how to make your own Anna. A few months ago I was asked by Rae at Fabric HQ if I would be interested in teaching this class (she knows how many times I've made the pattern!) and I was thrilled to be able to say yes, I'd love to! After some discussions over dates we've settled on a three part workshop in September and October, which will be held at Fabric HQ's lovely new premises in Stoke Mandeville, Buckinghamshire. You can see more pictures of their new place on their Facebook page. I know that not many of my readers are local enough to be able to attend, but if you are interested (or know someone who might be) you can read more about the workshop here. I'll also be teaching a freemotion machine embroidery class in November and Rae and I are cooking up plans for an Introduction to Dressmaking class. Details of these workshops are yet to be finalised, so aren't yet on the Fabric HQ website, but I'll let you know when they are. I'm both very excited and a little nervous about teaching this class. I'd better go and make myself another Anna and actually follow the instructions rather than go off on my own route, so I know what I'm supposed to be teaching! Thanks Manju. I do know my way round the pattern! Congratulations, Sam. Your dresses all look fabulous and I'm sure that your classes will be a great success. sam i love your annas!! while i'm not teaching anna... i *did* make one a couple weeks ago and thought BAH! instructions! who needs instructions! Thank you! Yes, instructions are just suggestions really, right? btw I can totally see you in my maxi Anna. What a shame we're not closer! It is rather too far for 3 evenings. SO excited for you.. I love this dress, and it looks so good on you.. KNow you will do a great job , teaching this class. Have fun. Love you Anna dresses and I wish I could be there. Congratulations on teaching this class. I know everyone will love you as their Anna teacher. Thank you Maria. You should make your own Anna, its a great pattern. Wow! How exciting! I wish there were more hours in my day to do classes. Sounds like terrific fun. Thanks Lucie. I've never actually taken a sewing class, thought I'd jump right in at the deep end and teach them instead!